Comments Off on Bruins Force Game 7 with Convincing 5-2 Win! Bruins Force Game 7 with Convincing 5-2 Win! The Bruins dominated the Eagles in a 5-2 win at the Bear Den tonight scoring 3 goals in the first period before one of the biggest crowds of the playoffs. Matt Allen finishing off a perfect passing play from Conner Miller on the power play making it 1-0 Bruins. Conner Beck on the left point found Miller to grab an assist as well. 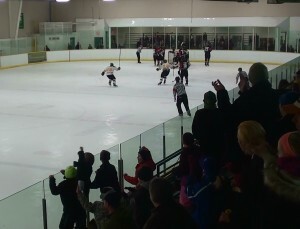 Then under 3 minutes later Jarett Smith’s (PP) bullet from the slot after a fake shot by Beck put Uxbridge up 2-0. Captain Allen also assisted on the play. Korey Brand’s hard work to dig the puck out to Adam Bartholomew who in turned passed off to Carter Vahey and he ripped a howl-ester from the point on what would be the winning goal to send the Bruins into the intermission up 3-0. Locke scored a short handed goal on a breakaway that was set up by Matt Pollard, going stick side for a 4-0 advantage. The Eagles got one late in the period to make it a 3 goal lead again after two. 43 seconds into the third, another point blast by Vahey gave Uxbridge a 5-1 lead as the power play had it’s third of the night. Beck and Jarett Smith assisted. The Eagles scored mid period to make the final 5-2 Uxbridge on the strength of Max Tjin’s solid play in goal for the Bruins. Game 7 goes Sunday at 6:20 in Clarington. Go Bruins Go! Comments Off on Eagles take 3-1 Series Lead! Eagles take 3-1 Series Lead! Despite holding a 3-2 lead heading into the 3rd period the Bruins could not hold off the Eagles attack, falling 5-4 tonight. Matt Trudel, Jarett Smith with two and Conner Beck scored for the Bruins. Cody Northover made 49 saves on the night taking the loss.. The Bruins will try to get back into this series tomorrow night Wed Feb.26 at 7:20 in Clarington. Comments Off on Uxbridge loses 7-3 to the Eagles in Game 3! Uxbridge loses 7-3 to the Eagles in Game 3! After falling behind 2-0 in the first period tonight, the Bruins battled back to tie it on the strength of two goals by Matt Allen and Jarett Smith. 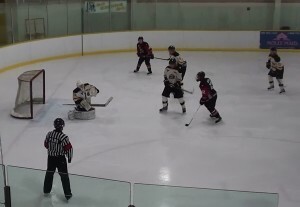 The Eagles replied with 5 straight before Uxbridge closed out the scoring on a goal by Tyson Eastgate in the third. Cody Northover was replaced by Max Tjin after the Eagles opened up a 5-2 lead. With Clarington leading 2-1 in the series, Uxbridge looks to tie it up at home on Tues Feb.25th (7:45pm) at the Bear Den. Comments Off on Bruins Comeback Bid Falls Short! Bruins Comeback Bid Falls Short! Comments Off on Bruins win opener in OT Thriller! Bruins win opener in OT Thriller! The Uxbridge Bruins take game one tonight in Clarington by a score of 3-2 in overtime on Adam Bartholomew’s unassisted goal at 2:24 of the first overtime period. The Bruins trailed 1-0 in the 1st period but fought back to tie it up on Bartholomew’s first goal of the game from Tim Bierema. Again the Eagles jumped out in front after 2 periods and it was Jeremy Toupin who sent this one to overtime with the tying goal from Marco Mastrangelo and Korey Brand in the third. Cody Northover stopped 40 of 42 shots on the night giving his team-mates a chance to pull off the victory. The Bruins will try to increase the series lead in front of a boisterous and large crowd Friday Feb. 21st at 7:45pm at the Bear Den. Hope to see you there! Comments Off on Bruins Clothing Available at Home Playoff Games! Bruins Clothing Available at Home Playoff Games! Now you can support your Bruins in true Team Colors. The Uxbridge Bruins are selling the following clothing at their home playoff games and Payment will be by Cash or Cheque only. In the spirit of playoff hockey don’t forget to make some noise and Raise the Roof in support of their playoff run! 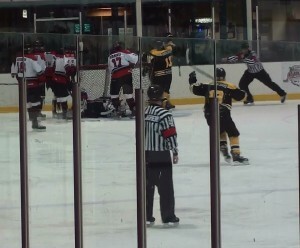 Comments Off on Bruins Defeat Clarington in Warmup for Playoffs! Bruins Defeat Clarington in Warmup for Playoffs! The Uxbridge Bruins played their final game of the 2013/14 season by taking a 3-1 decision against the Eagles in Clarington tonight. Carter Vahey scored the only goal in the first with assists to Jason Simmonds and Marco Mastrangelo. Mastrangelo potted one of his own just under a minute into the second period from Matt Trudel before a late goal by the Eagles. In the third it was Korey Brand (PP) unassisted with an insurance goal that gave Uxbridge the win. Cody Northover made 34 saves for the Bruins in goal as Uxbridge had 5 APM’S in the lineup including Michael Morgan, Luke Baldaro, Carson Bell, Liam Blais and Liam Knoll. The Bruins play Game One of their opening playoff series in Clarington Wed. Feb. 19th at 6:20pm with Game Two Fri. Feb. 21st at 7:45pm. We hope to pack the house with fans and that you bring your cheering voice to support the Bruins! For the complete playoff schedule please click on the playoff schedule link on the home page. Comments Off on Bruins Come From Behind for Shoot Out Win over the Ice! Bruins Come From Behind for Shoot Out Win over the Ice! The Bruins quickly fell behind 2-0 in Georgina tonight and then 3-1 after a Carter Vahey Power play goal. Also scoring on the man advantage was Jarett Smith and Korey Brand, sending the game to overtime and then a Shoot out and it was Smith and Vahey scoring for Uxbridge as they take a 4-3 win from the Ice. Comments Off on Bruins Strong start falls short in 9-5 loss to Lakefield! Bruins Strong start falls short in 9-5 loss to Lakefield! Despite scoring 2 goals for a first period lead and then regaining the lead 3-2 in the 2nd, the Bruins fall 9-5 to the first place Lakefield Chiefs tonight. Jeremy Toupin, Marco Mastrangelo, Jarett Smith, Matt Trudel and Matt Allen got the Uxbridge goals. A rare Friday off next week Feb.14th and then the final game of the season on Sunday Feb.16th in Clarington who will be thier playoff opponent in the first round. The schedule will be posted once it is available.